PAD is a common circulation problem in which the arteries that carry blood to the legs or arms become narrowed or clogged. Pain and restricted activity is the result. 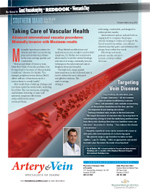 Learn how to be active again by treating Peripheral Arterial Disease PAD. Osteoporosis is the result of low bone mass and can steal the independence away from otherwise healthy adults. There are exciting new treatments that can help patients who suffer from compression fractures in the spine caused by osteoporosis. Learn more how kyphoplasty can help correct your osteoporosis. Radiofrequency ablation kills tumor cells with heat, while sparing healthy tissue. This treatment is patient friendly and more effective than systemic therapy. Learn more about radiofrequency RF ablation as a cancer therapy. Veins that have lost their ability to return blood efficiently, become elongated, rope-like, bulged, and thickened. Through a minimally invasive procedure, these unsightly veins can be a thing of the past. Learn more about spider and varicose veins. Healthy veins are important to your overall health. If you have leg pain or are finding that your leg veins are more noticeable, you may have Deep Vein Thrombosis. Learn more about deep vein thrombosis. PAD results from a build-up of plaque and scar tissue inside the arterial walls, restricting blood flow. This can cause pain, cramping, and tiredness in the legs or arms. Left untreated, symptoms will worsen and possibly lead to more serious problems. When lifestyle modifications and medications are not enough to resolve PAD symptoms, Dr. Shelley uses noninvasive ultrasound to locate the arterial blockage and remove it using a minimally invasive technique in the interventional suite at Bingham Memorial Hospital. The high-tech, image-guided instrumentation in this dedicated suite is used to deliver the most advanced and effective solutions. The suite's boutique setting is welcoming, comfortable, and designed to reduce patient anxiety. Interventional options include balloon angioplasty to compress the plaque, arterial stenting to widen and support the blood vessel from within, and catheter atherectomy that grabs and withdraws the plaque from within the vessel. Following treatment, patients usually return to normal activities within 24 hours. Leg swelling, discoloration, pain, fatigue, heaviness—all are common signs of venous insufficiency (varicose veins). Left untreated, risks include a worsening of the problem, breakdown of the skin, and the development of non-healing skin ulcers. Seeking treatment early results in the best outcome. On February 21, 2013, Dr. Shelley was a guest on KISU 91.1 FM's radio show House Call with Dr. Rahim in which he discussed varicose veins and restless leg syndrome. Listen to the show by clicking HERE. David Shelley, M.D., is board certified in Vascular and Interventional Radiology, a member of the American College of Phlebology (see Dr. Shelley's other accolades) and is a member of the Bingham Memorial Hospital Interventional Radiology team. Dr. Shelley has been highlighted in Good Housekeeping, Redbook and Woman's Day. Click here to review the full article. Hi, my name is and I would like to learn more about your treatments for select from list abdominal aortic aneurysms blockage kidney cancer liver cancer lung cancer deep vein thrombosis hypertension and end-stage renal disease liver disease osteoporosis pelvic pain (chronic) peripheral arterial disease PAD spider veins uterine fibroids varicose veins you can reach me at or email me at . Prepare for your appointment, fill out a patient information packet.